May is here and we are kicking things off with a bang. Monkey Madness II will be coming out tomorrow! We've also got plenty more in store for the rest of the month including the priority poll and a Great Kourend content poll. Let's take a closer a look at what is to come in May. The time has almost arrived... Only one day until the release of the first ever Old School quest - Monkey Madness II! Following the events of Monkey Madness, Glough has vanished. King Narnode requires your help once more in tracking down the war criminal Glough and uncovering his next evil plan. Let's take a look at a couple of the many rewards earned by completing Monkey Madness II. Upon completing Monkey Madness II you will gain access to an activity from which the components used to fletch ballistae can be obtained. Ballistae are slow, hard hitting ranged weapons comparable to Godswords and use javelins as ammunition. Ring of Suffering: a best-in-slot defensive ring. Necklace of Anguish: a best-in-slot ranged necklace which provides both ranged attack and strength. Tormented Bracelet: a best-in-slot magic bracelet which provides both magic attack and damage. Amulet of Torture: a best-in-slot melee amulet which provides stab, slash and crush attack as well as strength bonus. Early last week a content suggestion from a player named GentleTractor ended up taking the community by storm. 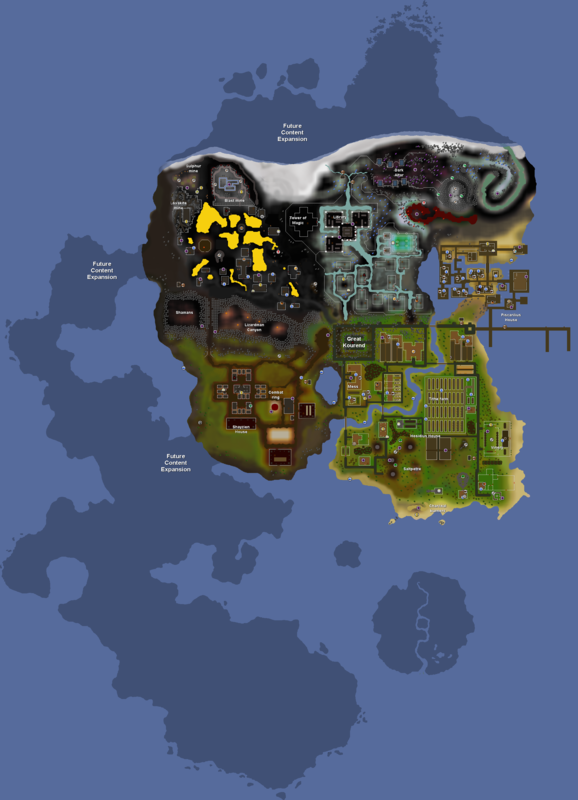 The concept was to refine Zeah's mapping and expand on the content found within the continent. In response to this, next week we will be running a content poll focused on expanding the content available in Great Kourend. We will be focusing on small to medium sized updates to fill out some of the unused areas of the city. We've been gathering content suggestions for this poll over the past week and will continue to do so over the weekend. If you have any suggestions you would like to see implemented, now is the time to send them our way! In addition to this content poll, later on this year we will be making changes to the design of Great Kourend. With the help of GentleTractor we have decided on a design for Great Kourend we would like to implement for Zeah batch 2, alongside raids. Below is a concept image which shows our goal for the design of Great Kourend, created by GentleTractor. Please note: this design is still subject to change. The changes made will make Zeah feel like a more natural land mass. This is a trend which will continue with the design of the future Zeah expansions. To follow up on our recent priority survey, later on in May we will be running a priority poll in a poll booth near you. The priority survey has provided us with a good idea of where the community currently stands on a lot of Old School RuneScape topics. We'll be using this information to craft a priority poll which every qualified Old School RuneScape player will be able to vote in. The results of this priority poll will help us decide the most appropriate path for the development of Old School RuneScape. Keep an eye out later on this month and have your say in the future of Old School. After passing the poll with flying colours, the clue scroll expansion is coming to Old School. Throughout May we will be developing the update for release in early June. Over the course of the month you can expect to see lots of information coming out about new rewards and clues. We will be implementing many of the community suggestions sent into the Old School mailbox and, at the very end of May, we will be announcing the winners of the clue scroll competition! You can read more about our plans for the clue scroll expansion in the clue scroll expansion developer blog. "The Month Ahead"? It's almost half gone!!! cool You. Yes, Me. Me, Me, Me. Me Too. MM 2 Hype is real! It's only the 4th. It's not half gone till the 15th May. I did say 'almost', plus it's already the 5th here.